GLAND, Switzerland, January 21, 2014 (ENS) – At least one in every four existing species of sharks and rays may not survive into the future, finds the first global analysis of the conservation status of 1,041 shark, ray and related species. The International Union for the Conservation of Nature, IUCN, hosts a clutch of species specialist groups that contribute information to its authoritative Red List of Threatened Species. “Our analysis shows that sharks and their relatives are facing an alarmingly elevated risk of extinction,” said Dr. Nick Dulvy, IUCN Shark Specialist Group Co-Chair and Canada Research Chair at Simon Fraser University in British Columbia. “In greatest peril are the largest species of rays and sharks, especially those living in shallow water that is accessible to fisheries,” he said. Overfishing is the main threat to the species, finds the study, the product of 302 experts from 64 countries. The Indo-Pacific, particularly the Gulf of Thailand and the Mediterranean Sea are the two spots where the depletion of sharks and rays is most dramatic. Also, the Red Sea is inhabited by many threatened sharks and rays, according to the experts. The 1,041 cartilagenous fish species studied include sharks and rays as well as chimaeras, cartilaginous fish that live deeper than 650 feet below the surface. The skeletons of these cartilagenous fish are made of cartilage rather than bone, making them desirable for food or pharmaceuticals. 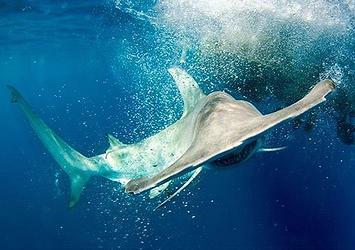 “The global market for shark fins used in shark fin soup is a major factor in the depletion of not only sharks but also some rays with valuable fins, such as guitarfish,” the scientists say. Sharks, rays and chimaeras are also sought for their meat, pharmaceuticals are made from deep sea shark livers, while manta and devil rays are used in a Chinese tonic. The sharks, rays and chimaeras are at a “substantially higher risk than most other groups of animals and have the lowest percentage of species considered safe – with only 23 percent categorized as Least Concern,” the authors state. Reported catches have been dominated by rays for the last 40 years, the experts calculated. 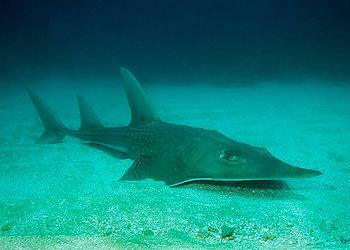 “Surprisingly, we have found that the rays, including sawfish, guitarfish, stingrays, and wedgefish, are generally worse off than the sharks, with five out of the seven most threatened families made up of rays,” said Dr. Colin Simpfendorfer, IUCN Shark Specialist Group co-chair and professor of environmental science at James Cook University in Queensland, Australia. Unintentionally caught sharks and rays account for much of those killed, yet developing markets and depleting fishery targets have made this “bycatch” increasingly welcome. Intentional killing of sharks and rays due to the perceived risk that they pose to people, fishing gear or target species is contributing to the threatened status of at least 12 species, the IUCN analysis finds. Yet this kind of shark killing is about to happen off the coast of Western Australia. Today the Conservative Australian Government led by Prime Minister Tony Abbott exempted Western Australia from the country’s environmental laws to allow a shark cull in state waters after six deadly shark attacks in the past two years. Australia’s West Coast is called the most dangerous shark attack zone in the world. The shark culling plan emerged after a surfer died in a shark attack at Lefthanders Beach in November. Australian Environment Minister Greg Hunt justified the state’s exemption from environmental laws, citing the tragedies of lethal shark attacks. 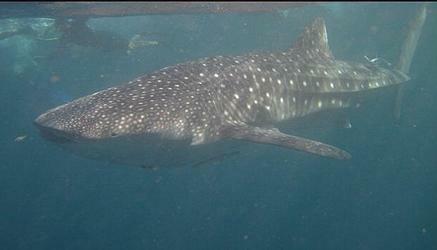 He said evidence shows a recent increase in shark-related incidents in Western Australia. The shark cull will use baited drum lines with hooks designed to catch large sharks. The drum lines can be set at least one kilometer from the shoreline of Western Australia from January 22 to April 30. Professional shark hunters will be hired to patrol offshore. Any great white shark, tiger shark or bull shark greater than three meters long caught in the state government’s “kill zones” will be killed, even though species like the great white are vulnerable to extinction. The exemption helps the Western Australia government to bypass a lawsuit from a coalition of conservation groups that claims the shark cull is contrary to state, federal and international obligations. “This exemption demonstrates the complete failure of the Federal Government to protect our most precious species and fulfill our international environmental obligations, for the price of a policy which we do not believe will have the desired impact of reducing risk for people, which is its stated purpose,” she said today. But there is little likelihood that Premier Colin Barnett will cancel the cull.